The Punjab Government has accorded all mandatory approvals and allotted 30 houses to the Tata Memorial Centre (TMC), Mumbai, for setting up the country’s second-of-its-type TMC’s Homi Bhabha Cancer Hospital and Research Centre in New Chandigarh, close to the PGIMER. With this, the construction work on the Rs 480-crore project, the foundation stone of which was laid by the former Prime Minister, Dr Manmohan Singh, in December, 2013, has picked up. The project is targeted to be completed within 24 months. Confirming the development, Additional Chief Secretary, Housing and Urban Development, Punjab, Vini Mahajan, today told The Tribune that Invest Punjab, a single-window system, had already issued the Letter of Regulatory Clearance-I (LORC-I) to the project proponent while the LORC-II was likely to be issued shortly. The Union Department of Atomic Energy (DAE) has awarded the construction work to Shapoorji Pallonji Construction Company Private Limited (EPC Developer), which will raise the project within two years. “The company has already mobilised its men and machinery at the site, including requisite set-up to undertake the main construction work in full swing,” a senior TMC functionary disclosed. He disclosed that the foundation work had already picked up. The total value of the contract awarded to Shapoorji was Rs 217 crore, covering all works, except medical equipment, which would be procured separately from the total project outlay of Rs 480 crore. 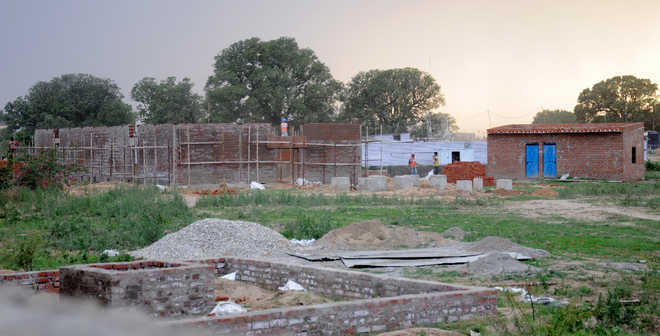 To provide affordable housing for the faculty and other staff members of the upcoming cancer hospital, the Greater Mohali Area Development Authority (GMADA) has allotted 30 houses, including 10 each three-bedded, two-bedded and single-bedded, as desired by the TMC, at Purab Premium Apartments in Sector 88, Mohali. “Acceding to the request of TMC Director Dr RA Badwe, we have allotted them 30 houses, which will facilitate the faculty and staffers of the new facility to easily settle down here,” Mahajan disclosed. It was on December 30, 2013 that the foundation stone of the state-of-the-art cancer institute was laid, but it took over three years for the Union Department of Atomic Energy to allot the work on the project. The Punjab Government had allotted 50 acres worth almost Rs 100 crore in Medicity to the TMC to establish a world-class cancer institute. The TMC has already set up Homi Bhabha Cancer Hospital in Sangrur. “It is functioning very well and extending excellent support to cancer patients of the region at very affordable cost,” a senior government functionary said. The Union Department of Atomic Energy will spend Rs 480 crore on setting up the 100-bedded second-of-its-type cancer hospital on the lines of the TMC hospital in Mumbai. According to the project report, it will be a “world-class institution for a noble cause” with a mandate for service, education and research. To be set up on the lines of the TMC-Mumbai, the institution will aspire to be a tertiary care centre for cancer, promoting prevention, cure, rehabilitation and palliation for the population of Punjab, Haryana, Himachal Pradesh, Jammu and Kashmir, Rajasthan, Uttarakhand and Uttar Pradesh. The infrastructure of outpatient services will aim at maximising ambulatory care and minimising the need for hospitalisation. The provision of ambulatory services in an outpatient setting will minimise morbidity and costs involved in hospitalisation and maximise services with revenue optimisation. The outpatient services will comprise consultation, diagnostic investigations, daycare surgery, biopsies and stent placements, minimal access surgeries, laser surgeries, chemotherapy and radiotherapy. The diagnostic services will comprise laboratory and imaging services. These will be juxtaposed between the outpatient and inpatient areas, preferably in a standalone building to ensure quick access and logistics management. Surgical oncology, operation theatre complex, radiation oncology facilities, medical oncology and intensive care complex will constitute therapeutic facilities. The inpatient services will be consistent with the intensity of care and will comprise patient rooms, general wards, intensive care unit, high dependency unit, bone-marrow transplant ward, isolation rooms and mortuary. The hospital will also provide preventive oncology service, telemedicine, rehabilitation services, support services infection control and waste management, education and training and logical clustering of facilities.